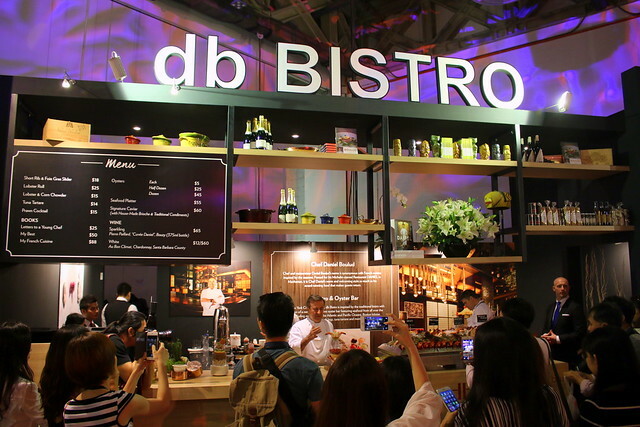 Epicurean Market is back for the fourth year at Marina Bay Sands. 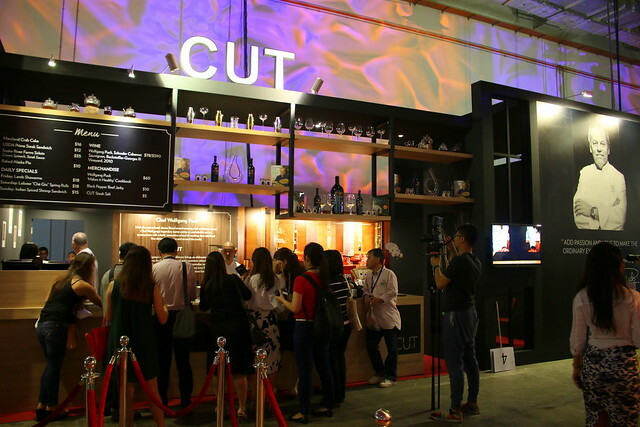 The three-day festival (12-14 August 2016) has celebrity chefs in town to give Masterclass cooking demos and workshops, an expanded Farmer's Market and even more seating. 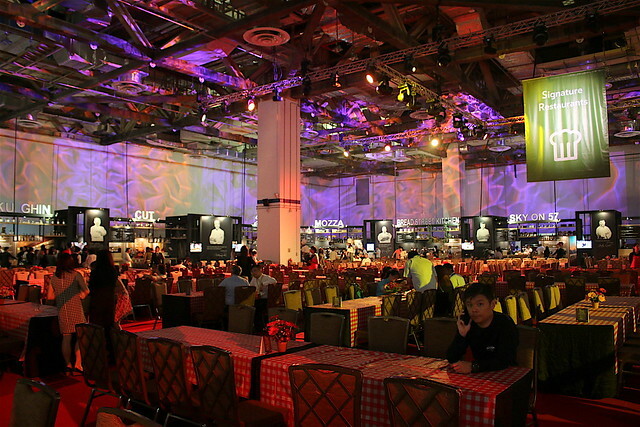 The event takes up all three Hall A, B, and C at the Sands Expo and Convention Centre, Level 1. 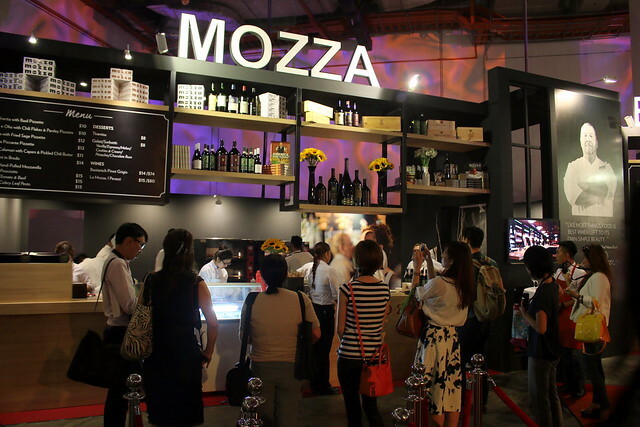 There are so many food events in Singapore, but this one big advantage - air-con! This year, we have guest restaurants like Yardbird, North and Golden Peacock that are definitely worth a visit. 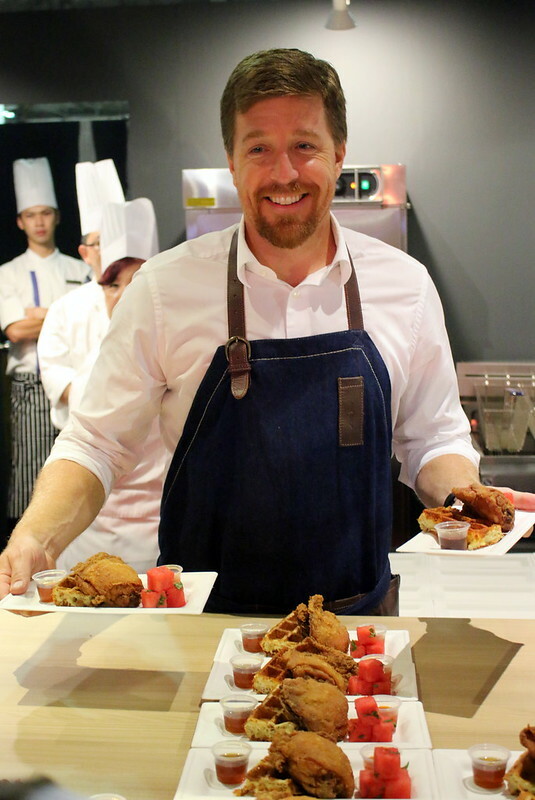 Yardbird CEO John Kunkel served Southern favourites like fried chicken (one of his favourite dishes). 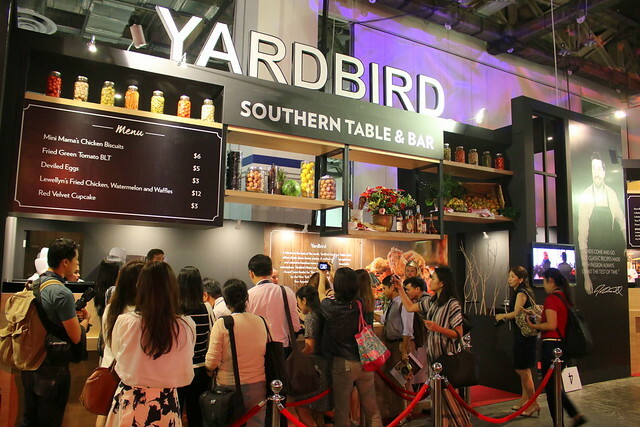 Yardbird is opening first quarter of 2017 at MBS, and I really can't wait. 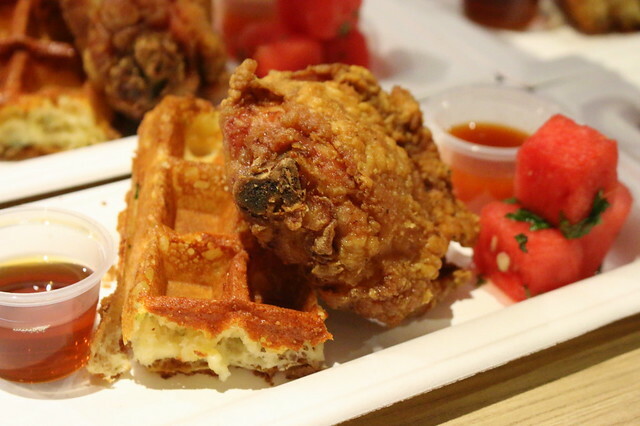 Lewellyn's Fried Chicken, Watermelon and Waffles: amazingly juicy (yes, the chicken juices squirted out as I took a bite) and perfectly crispy. The Waffles came with a delightful Bourbon syrup too. And the lime-spiked watermelon made a great palate cleanser. Adrift is also one of my favourite stops. Last year everything here was stunning. 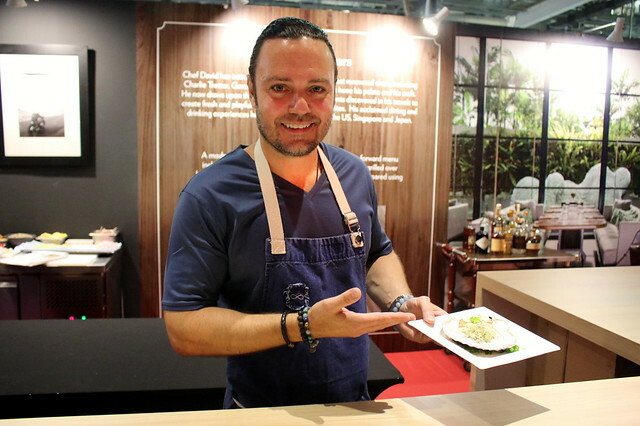 Chef David Myers truly knows food alchemy. 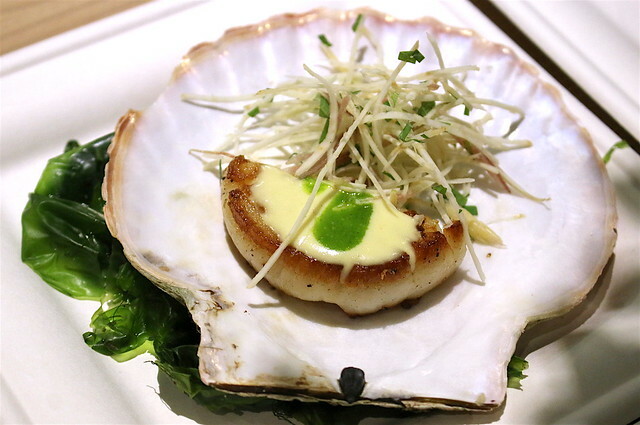 Grilled Hokkaido Scallop with Lemongrass, Celeriac, Myoga (Japanese ginger): Yes, what could be better than a plump Hokkaido scallop grilled perfectly? The lemongrass cream is beautifully aromatic. 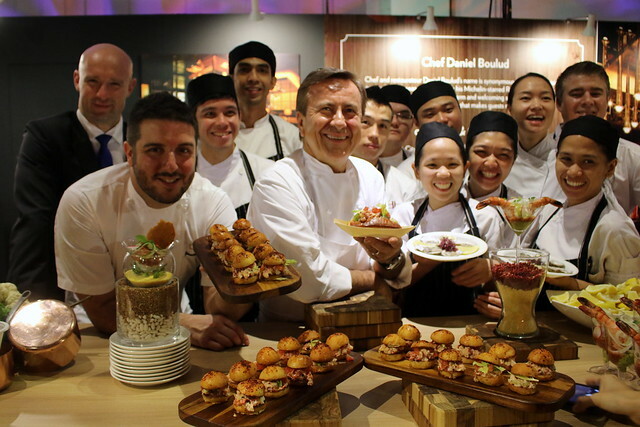 Daniel Boulud of course was at his db Bistro booth. This is the full size Lobster Roll - even the little slider samples we tried were refreshing and umami. They serve little pizettes. 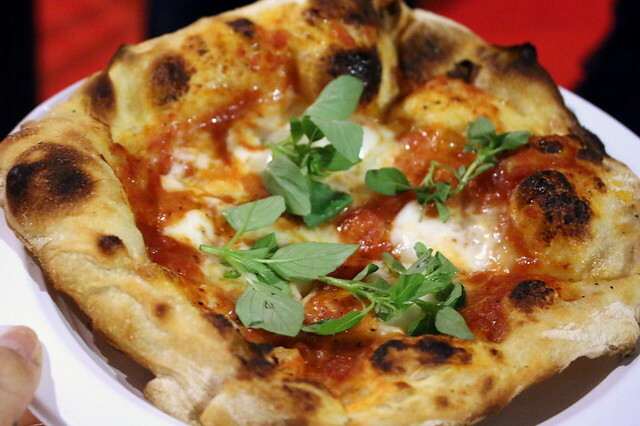 This one is Margherita with Basil. Loved the texture of the thin, chewy crust. 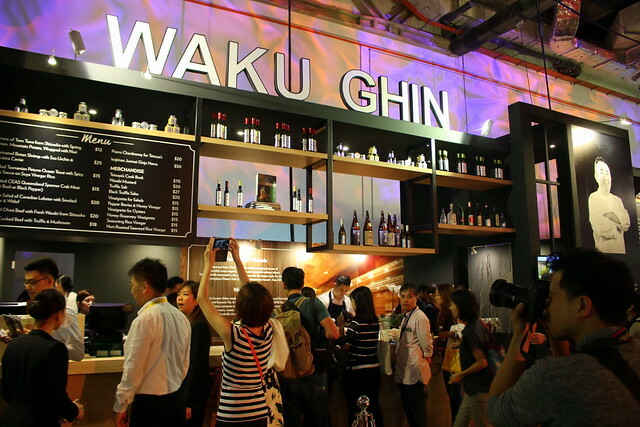 Waku Ghin saw queues the minute the Epicurean Market was declared open. 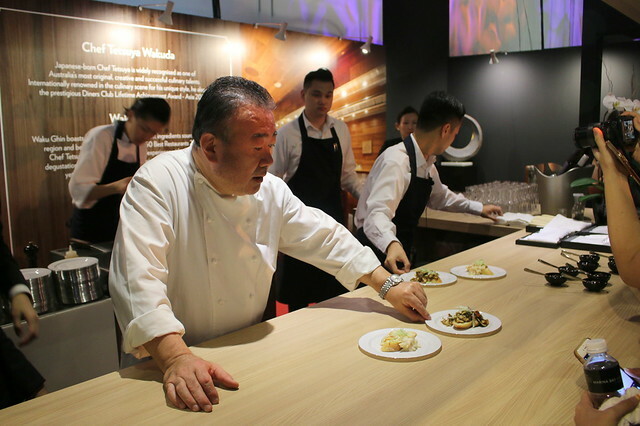 Tetsuya Wakuda, now a familiar face at MBS, showed his usual gentle, understated charm. He prepared two dishes specially for the market - his version of chili crab (with basil), and black pepper crab - both using spanner crab. 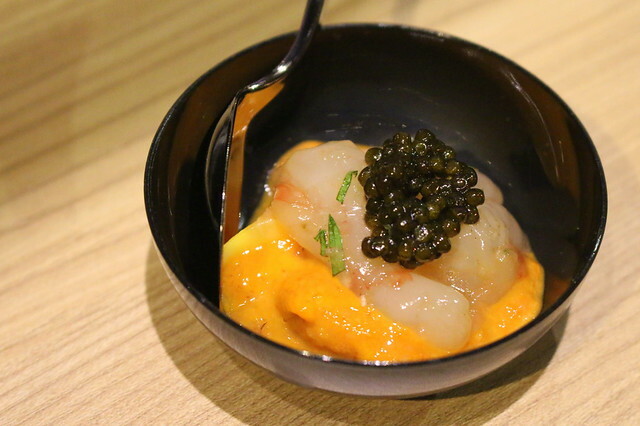 The Marinated Botan Ebi with Sea Urchin and Oscietra Caviar is a signature that's prevailed as a hot favourite through the years. 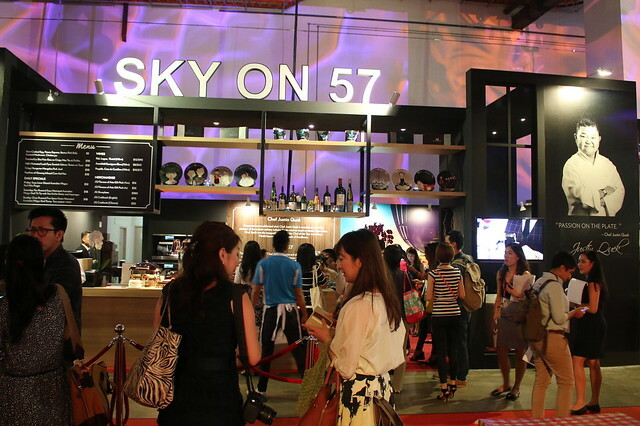 Sky on 57 is where you'll get treats like Crispy Hungarian Mangalica Pork Jowl, and Hijiki Marinated Loch Fyne Scottish Salmon Tartare on Toast. 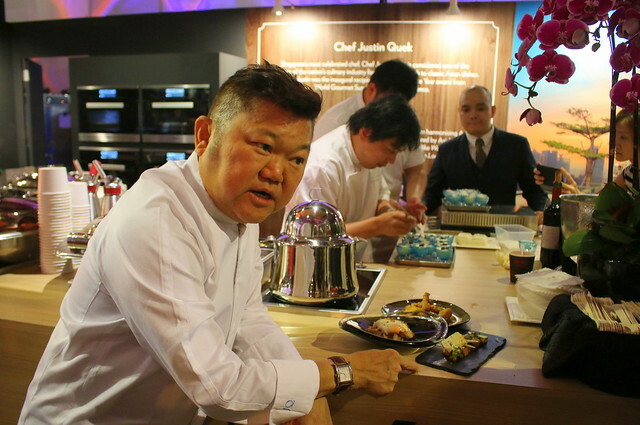 Justin Quek, our homegrown success, has also just launched JQ Flavours ready-made sauces and dips for home cooks. 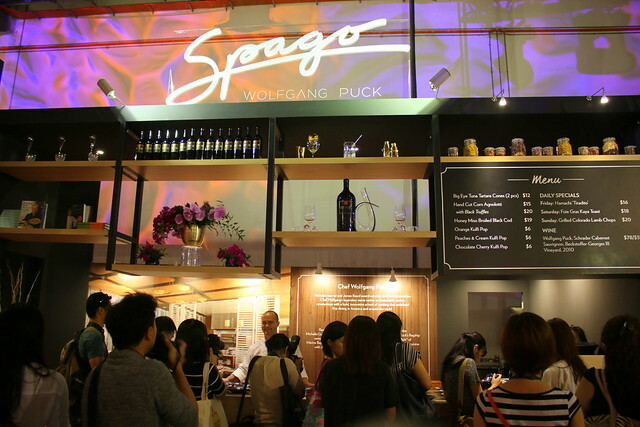 Wolfgang Puck has both CUT and Spago represented. 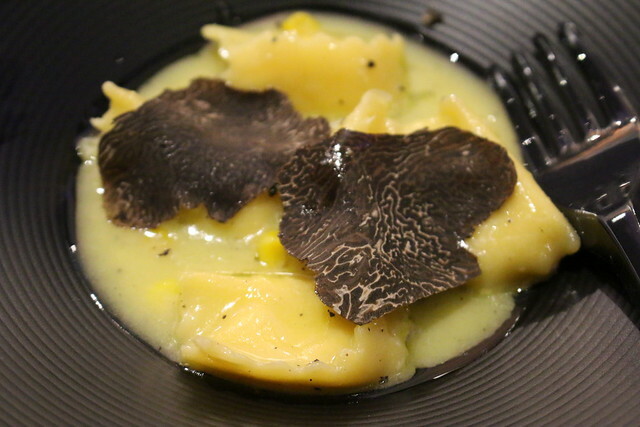 The Handcut Corn Agnolotti with Black Truffles at Spago was not only a comforting plate of carbs but an extremely luxurious one too. The highlight at CUT is of course the steak, and in particular the Snake River Farm Sirloin. 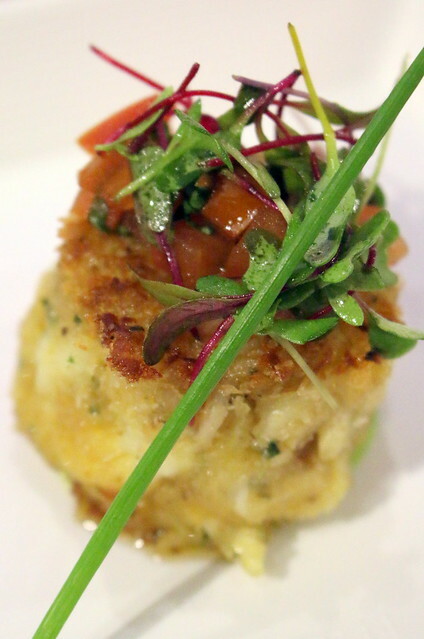 We were given the Maryland Crab Cake instead to try though. It was somehow a bit too doughy. 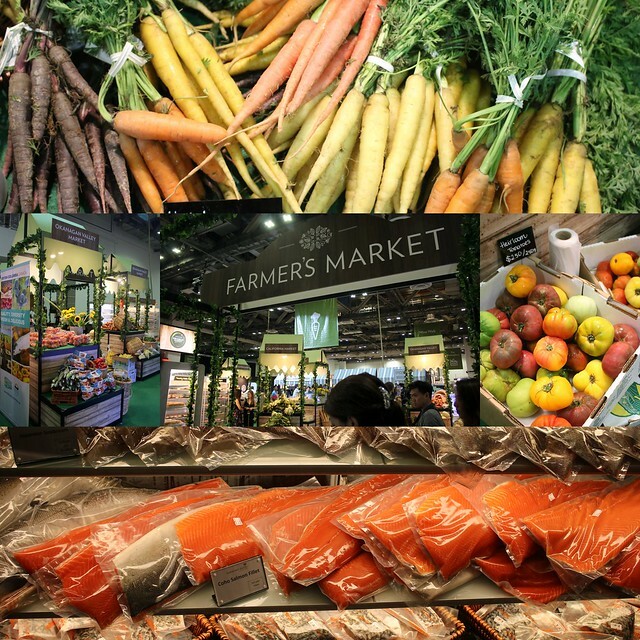 There is also a Farmer's Market featuring produce from all over, making it easy for you to purchase gourmet ingredients. 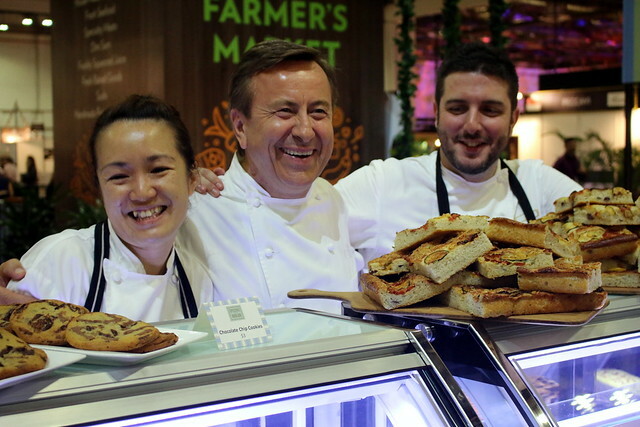 Daniel Boulud has also set up an Épicerie Boulud, feauring products from his beloved eat-in and take-out cafe: cakes, bakes, pastries and pates. This year they allocated more seating space. The Picnic area not only looks more spacious but is also lit up with bright neon colours. 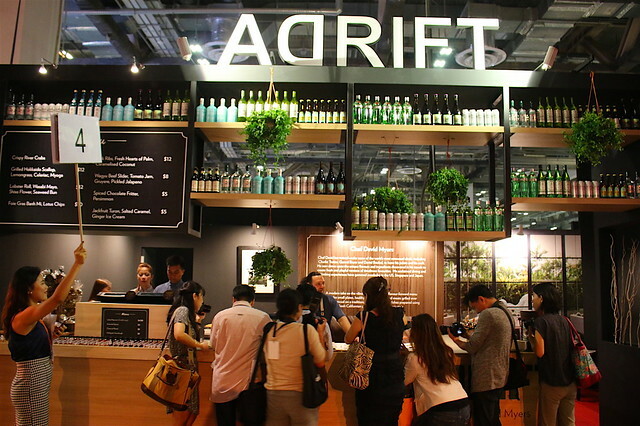 Tickets for Epicurean Market cost S$35 for a three-day pass with entry to the after-party on Fri and Sat. Visitors will also receive a take-home gift of a pair of Schott Zwiesel champagne flutes worth $46 (while stocks last).